3 - 3,3..........Jago von Beelen. 3 - 3.............Bronco vom Zenn. 3 - 5.............Guys Hilo vom Norden Stamm. 5,5 - 5..........Vello von Fürstenfeld. 1993: 78-93-95 = 266 (18th). 1993: 96-97-92 = 285 points (1st). 04/06/1994: 100-95-95 = 290 points. 30/04/1994: 70-97-100 = 267 points. 10/04/1994: 98-98-95 = 291 points. FCI World Champion in 1992. I24 x CAC, 14 x CACIB, 15 x BOB, 5 x Beste FCI-group 2, 2 x BLS. 18-10-1992: Siegerklasse V 1 / CAC, CACIB-Euro-Sg, Best der Rasse. 06-12-1992: Siegerklasse V 1 / CAC. Overall Build: Powerful; thick soft fur; good colour and markings; masculine profile, correct head; sufficient underjaw; eyes dark-brown; short and firm back; very good croup; very good front and sufficient rear angulation; free and balanced gaiting, very good firmness in back and ligament. Nature: Spirited, lively, open and sure. Very high protective instinct and fighting spirit, high courage and hardness with middle sharpness. Note: Suitable to improve character and conformation. Hertog Conan van Manensheide was the winner of the D.V. Meisterschaft in 1993 with 285 points and placed eighteenth at the World Dobermann Cup in 1993 with 266 points. He passed the Körung 'for life' with highest possible rating for working drives and high rating for hardness and courage. He was also a winner of numerous International and German show championships. He lived to 7 years of age and the cause of death was Bloat. His sire, Wasko vom Binselberg, passed the Körung with Körklasse 1A rating and became German Show Champion and VDH Sieger. Wasko lived to 7 years of age. Hertog Conan's dam also passed the Körung with Körklasse 1A rating. “This black male, bred in Holland from pure German stock is the living proof that success in the show ring does not preclude success in the working field and visa versa. 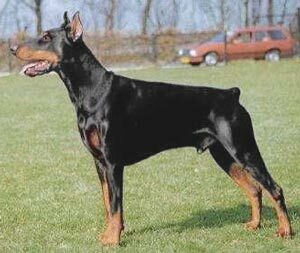 Hertog Conan is the first Dobermann in history and till now the only Dobermann to become a DV Schönheits Sieger and a D.V. Leistungs Sieger (A conformation Winner and Working Winner). He won his permanent place in the breeds history. His beauty brought him the Europa-Sieger, IDC-Sieger, Bundessieger, DV-Sieger title as well as many Champion titles. In 1992 he even won his World Champion title in Spain. Structurally he is well built with good shoulders and front. He has a deep, broad chest, a strong head with correct planes and a pleasing expression. His tailset is O.K. and his movement is good. His character brought him numerous wins in the working field and in 1993 the D.V. Leistungssieger title. He passed the Schutzhund tests many times and IPO III as well as the tough German Körung with highest qualifications. Of course Hertog Conan is a magnificent working dog, stately and full of temperament when working. Ohra: SchH 3 and passed the Körung with Körklasse 2B rating. She is dam of the von der Urftquelle “A, C” litters (Alfred, Apollo, Curd, Cleo). Nero: SchH 3, FH and passed the Körung with Körklasse 2B rating. He is sire of the von der Burgstätte “B” litter (Baghira). Ningicosan: SchH 3, FH 2, DV-DM participant and passed the Körung 'for life' with Körklasse 2A rating. He is sire of the von der Weyermühle “Q, R” litters (Qastra, Rasmus). Pacco: SchH 3 and passed the ZTP with 1A rating for character and SG for conformation. He is sire to Briska's “M, Q” litters (Milla). Gabor: SchH 3, IPO 3, FH and passed the Körung with Körklasse 1A rating. He is sire of the vom Edertal “B” litter (Bonny). Gallus: SchH 3, FH, DV-DM participant. Ginger: SchH 3 and dam of the vom Olymp “J” litter. Kira: SchH 1 and dam of the vom Tschirgantblick “M, N” litters (MyLady, Nada). Amigo: SchH 3, FH, DV-DM participant and passed the Körung with Körklasse 2A rating. He is sire of the vom Heiligenwald “D, F” litters (Divina, Fanto) and van de Erjolihof “R” litter (Rowan). Betty: SchH 3, DV-DM participant.